The international robot competition will simulate a Fukushima-like disaster. Move over, ASIMO. The new humanoid robot from the U.S. Department of Defense’s Advanced Projects Agency (DARPA) does away with the cutesy voice and toy-store design in favor of something much more Terminator-inspired. The hulking 6-foot 2-inch bipedal machine weighs 330 pounds and achieves unparalleled mobility thanks to 28 hydraulically actuated joints. 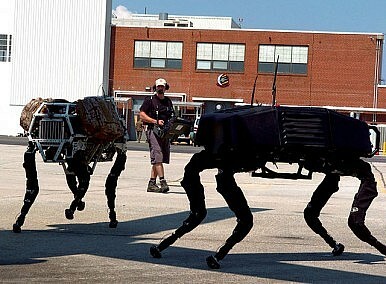 Atlas, built by Boston Dynamics with funding from DARPS, is modeled after the ultra high-tech robotics firm’s Petman. Judging from Boston Dynamics’ earlier projects, including BigDog and Cheetah, it is highly unlikely that Atlas will suffer from an embarrassing loss of balance like its Honda-made predecessor. In fact, Atlas was designed to take a beating while remaining upright. In a video released earlier this week, DARPA shows off the Atlas Proto robot jumping from a ledge, navigating over a gap in the ground, and quickly climbing stairs without falling. Then, the current Atlas is shown balancing on one foot and then being hit by a wrecking ball. It stabilizes itself while remaining on only one foot. Finally, researchers put wooden planks under a walking Atlas’ feet. The robot manages to take one step onto the plank, step off, and readjust its path to avoid the obstacle. “It's designed to not only walk and carry things, but can travel through rough terrain outdoors and climb using its hands and feet. Its head includes stereo cameras and a laser range finder,” said CNET. While Boston Dynamics’ other robots are primarily designed for military applications, Atlas will be accessible to civilians. For DARPA’s international Robotics Challenge (DRC), seven lucky teams will have the opportunity to program Atlas with their own custom software. The DRC kicked off in October 2011, and will continue this December in Miami. The DRC will pit teams of robot engineers against each other in a simulated industrial disaster setting, reminiscent of the March 11 2011 disaster in Japan. “DARPA specifically mentions the Fukushima Dai-ichi nuclear accident as an example of a disaster that would have benefited from more capable robots. In fact, the scenario DARPA is planning for the final competition closely resembles the dramatic events that unfolded in the first 24 hours at Fukushima, when human workers attempted but ultimately failed to fix one of the crippled reactors,” said IEEE Spectrum. Tasks that the challengers’ robots must be able to complete will be breaking down a wall, finding a leaky pipe, and fixing a cooling pump. The winning team will be awarded a $2 million cash prize by DARPA.